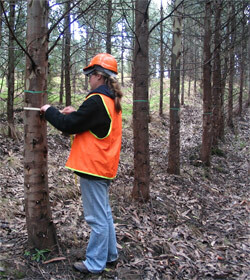 Measuring the progeny of a high quality Derford Nitens seed orchard tree at age 6 years. Note the difference in growth rate compared with the trees grown from unimproved seed in the background. 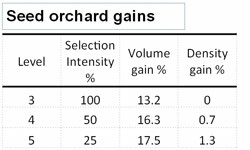 Predicted gains at rotation for the orchard seed compared with native forest seed based on data from the progeny trials. Levels represent increasing selection intensity. Derford Nitens has been producing genetically improved Eucalyptus nitens seed since 1997. The original seed orchard was established at Bream Creek in southeast Tasmania in 1990. The best selections were grafted and established in clonal seed orchards in 2000. Derford Nitens seed can be purchased from seedEnergy. The Bream Creek orchard underwent its first thinning in 1997. The original selection was based on predicted breeding values for growth and wood density. These were combined in an index using economic weights derived for a breeding objective to minimise the total cost of kraft pulp production. The genetic quality of Derford Niten's seed has been continually improved by increasing the intensity and accuracy of selection of seed orchard trees. Seed is harvested from only the very best orchard trees, rather than simply harvesting the entire orchard, as is common practice. Furthermore, the accuracy of selection of parent trees has been improved via backward estimates of deployment values derived from progeny trials rather than using less reliable forward estimated breeding values. Two progeny trials were established in Tasmania in 1999 to compare the performance of seed from the orchard selections and native forest seed. Trees in the trials were assessed for diameter growth (age 6 years), wood density (age 4 years), shrinkage (age 4 years) and stem straightness (age 3 years). Greaves (2005) found the orchard seed yielded a volume gain of approximately 19% over native forest seed at age 6 years. Predicted gains at rotation from increased selection intensity are substantial (see Table). Seed harvested from the best ranked trees is available for purchase.